Ever since Valve Software released the original Portal in 2007 fans have been building and rebuilding replicas of the game’s most important object: The titular portal gun. Some of these DIY projects have been amazing, some have been disappointing, but all demonstrate what a rabid, devoted fanbase Valve Software has cultivated via that particular franchise. That said, none of these faux, homemade guns have featured 100-percent source-accurate functionality. Then again, that’s to be expected given that pulling open the fabric of time and space in the pursuit of human teleportation is both currently impossible and probably a really terrible idea. However, one doesn’t necessarily need to break the laws of physics to recreate portal gun functionality, as demonstrated by the latest project from hacker Caleb Kraft. While Kraft’s weapon is incapable of creating color-coded doorways to other places, it does a very admirable job of mimicking Portal’s item carrying mechanic. When playing Portal, if you attempt to lift an object — we’ll use the Weighted Companion Cube as an example for reasons that should be apparent — that object will seemingly float in the air directly in front of your character. Initially this was a workaround created for Valve’s classic shooter Half-Life that allowed players to pick stuff up in a convincing fashion, despite the protagonist’s noticeable lack of on-screen hands, but in Kraft’s mind (and in his hack), the portal gun is capable of levitating objects. To create his gun, Kraft purchased an off-the-shelf replica of Portal’s iconic weapon. According to Kraft this was not so much an effort to reduce the effort he would have to put into his gun, but was instead a simple way to save time. Once he’d acquired this toy, Kraft set about reinforcing its otherwise flimsy arms with small pieces of metal, then attached magnets salvaged from another toy, specifically a floating globe similar to the one seen here. Once that was complete Kraft set about building an object for his gun to levitate. 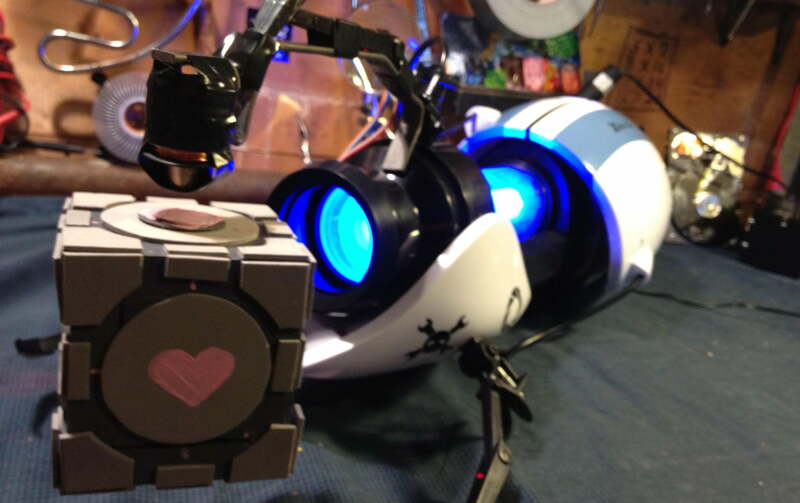 Being an obvious Portal fan, there was only one real option for Kraft: He had to build a scale replica of Portal’s iconic Weighted Companion Cube. Though all of this sounds like a fantastic idea for a homemade project, you can’t really grasp the full appeal of this gun until you see it in action. Fortunately Kraft’s homage was recently featured on Hackaday, and as per standard operating procedure for the site, the description includes both video of the device in action and an exhaustively detailed set of instructions that can either serve as an informative outline of what Kraft has done here, or a walkthrough on how to complete your own functional portal gun. That video is embedded below this text, but we urge any of you with a crafty streak to visit Hackaday and dig into the really meaty info Kraft has laid out there.